I’m a sucker for sales, even though what might look like good deals end up costing me more than I should be spending. When Twilight Time recently had an anniversary sale, I ended up ordering a stack of disks I couldn’t really afford. But despite the prickings of conscience about financial irresponsibility, I do love getting those packages in the mail. I’ve already written here about some of these disks – To Sir, With Love, Equus, The Bride Wore Black – and some of these disks deserve more in-depth coverage than I have time for right now, but for now I’d just like to acknowledge them and offer a few pertinent comments. Hollywood, despite its reputation in some circles for being a hotbed of radical leftist agitation, has always been uncomfortable with politics. Being a business with high overheads and an appetite for big profits, the movie industry has shied away from making overt political points more often than not, generally couching any social commentary in narratives which focus on individuals rather than a critique of political ideas. This occasionally results in murky and confusing movies, more often in merely superficial ones which do little to upset the status quo. Even the superficially more radical movies of the mid-’70s, like All the President’s Men, end up saying little about the workings of a complex political system subject to massive corruption; that film’s focus is on its intrepid heroes heroically solving a mystery and proving that deep down the system does in fact have self-correcting mechanisms to deal with damaging excesses. It would be hard to find in any mainstream Hollywood movies the kind of analytical treatment of political events seen in the best work of Costa-Gavras, but two recent Twilight Time disks illustrate approaches to politics taken by Hollywood. Richard Fleischer’s Che! (1969), which I hadn’t previously seen, turns out not to be the campy car-wreck I had imagined. Fleischer was always a competent craftsman and on the whole Che! is just that – competently crafted. The problem is that it really doesn’t know what it’s trying to say. The executives at Fox were floundering at the end of the ’60s as the seismic shifts in American society were making traditional studio productions (increasingly expensive) less and less relevant. These were the years when an essentially conservative industry was flailing around looking for ways to attract the counter-culture back into movie theatres. And Che Guevara was a hot property, visible on t-shirts everywhere as a symbol of opposition to the status quo. But what all this might mean in any larger sense was lost on scriptwriters Sy Bartlett and Michael Wilson. Rather than dealing with political issues, the screenplay treats Che and Fidel Castro as celebrities whose personal ambitions create friction even as together they push forward the revolution against the corrupt Batista regime in Cuba. Che is a doctor determined to cure the body politic of its festering disease, while Castro is a cigar-chomping egotist who apparently possesses little in the way of strategic or tactical ability; although Fidel is the face of the popular revolution, Che is the brain who puts the other man on top. Fidel is such a vacuum that once the revolution succeeds he doesn’t seem to know what he wants to do with his new power, while Che sets about massacring their enemies. After a falling out, Che heads for Bolivia hoping to inspire a continent-wide revolution, only to find that the oppressed peasants just want to be left alone to tend their sheep. It all fizzles and Che ends up betrayed and dead. Because the film makes no effort to delineate the complex political and economic situation of these countries, both of which were in thrall to U.S. business interests and the political system which backed up the corporations, what we’re left with is the sit-com bickering of the grimly serious Che and the oafish Fidel and the final implication that revolution is really just an ego-driven game played by people with no larger purpose than attaining personal power for themselves. It’s clear that no one involved really had any point to make about recent critical political events; they were making the movie because those events were news and obviously meant something to the young audience the studio was hoping to lure in. But that said, Che! does have some entertainment value thanks to the lead performances of Omar Sharif as Che and an amusing Jack Palance as Castro. Roger Spottiswoode’s Under Fire (1983) is in every sense a far superior film. Set during the Sandinista revolution against the corrupt Somoza regime, it has a gritty, seemingly authentic surface realism, a script which provides substantial characters for the stars to play, and a sense of moral purpose. Made shortly after the revolution overthrew Somoza and while the U.S. government under Reagan was ramping up the training and military support of the terrorist Contras which eventually smashed the reforms which briefly held out the possibility of self-sustaining independence, the film centres on a trio of American journalists who move from one war to another apparently in pursuit of an adrenalin high rather than any higher purpose. 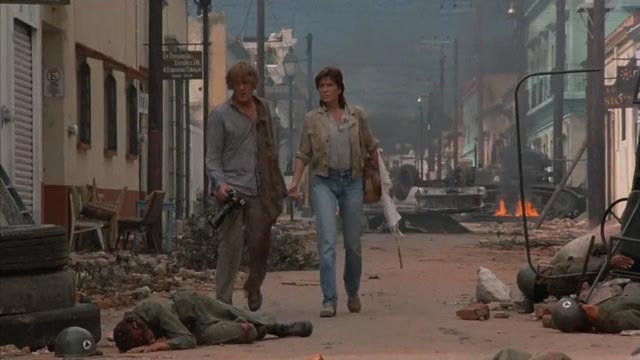 The focus on what is essentially a familiar romantic triangle – photojournalist Russell Price (Nick Nolte); Alex Grazier (Gene Hackman), who’s moving up the corporate media ladder; and Claire (Joanna Cassidy), the reporter they both love – deflects attention from the underlying political issues, personalizing events in the way the old studios always did. Despite the film’s obvious sympathies with the Sandinistas, its privileging of the three Americans both as the dramatic focus and, eventually, as the key element in the revolution’s success relegates the situation of Nicaragua and the U.S. role in the country’s politics to mere background for an individualist moral drama. The narrative hinges on Price’s decision to set aside his journalistic “objectivity” and fake a major photograph to save the revolution from collapse. Even though the people involved in the production – Spottiswoode and writers Clayton Frohman and Ron Shelton – are smart enough to be aware that this focus on the Americans is problematic (a Nicaraguan woman, seeing the collapse of American support for Somoza after his troops senselessly murder an American, a plot point based on an actual event, is allowed to comment that it’s a pity they didn’t kill an American thirty years earlier), the film nonetheless makes these three Americans the heroes not simply of the narrative but of the revolution itself, an inadvertent reiteration of U.S. imperialism which sees other nations and their people as tangential to American interests. Twilight Time’s Che! disk is pretty bare-bones, including only a brief promo featurette and an isolated track for Lalo Schifrin’s score. The Under Fire disk has more substantial extras, including two commentary tracks, one with Spottiswoode, assistant editor Paul Seydor, Nick Redman, and photojournalist Matthew Naythons, the model for Nolte’s character; the other focusing on Jerry Goldsmith’s distinctive score, with music mixer-producer Bruce Botnick, music editor Kenny Hall and film historians Jeff Bond, Julie Kirgo and Redman again. There’s also a brief reminiscence by Joanna Cassidy and excerpts from Naythons’ photo archive. Strangely, Hollywood sometimes inadvertently reveals more about politics when overtly avoiding the subject altogether. 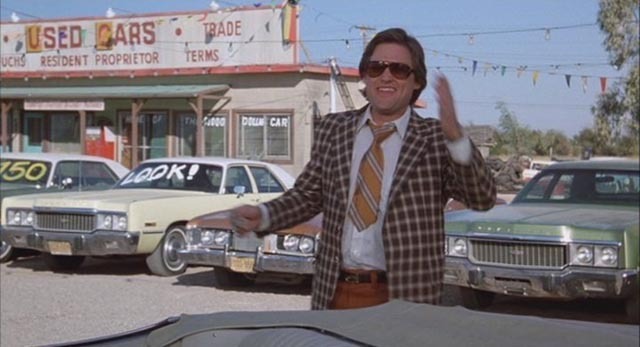 Robert Zemeckis’ second feature, Used Cars (1980), written like its predecessor I Wanna Hold Your Hand (1978) by Zemeckis and Bob Gale, is a raucous, foul-mouthed comedy which revels in capitalism at a grass roots level. This isn’t the refined greed of unregulated bankers; its the raw greed of ordinary people scrambling to make a buck any way they can – appropriately, as the title declares, in what is traditionally seen as the haven of unscrupulous liars, the used car business. What gives Used Cars its crude energy is its utter lack of any concern for ostensibly moral behaviour. Hollywood tradition had always required some kind of hero, someone driven by the urge to do right; here, however, the “good guy”, salesman Rudy Russo (Kurt Russell), is as immoral and crooked as his nemesis, Roy L. Fuchs (Jack Warden), who runs the lot on the other side of the highway. Zemeckis and Gale have no interest in the small guy battling corrupt big business; Rudy is scrambling to come up with enough money to buy himself an election because he knows that once in office he’ll be able to make out like a bigger bandit than he already is. When his schemes include hiding the death of his boss Luke Fuchs, Roy’s nicer brother, and deceiving Luke’s daughter, there’s no ultimate comeuppance; Rudy’s crass ambition triumphs, with him getting money and the girl, who turns out to be as willing as he is to bend rules to make a buck. Used Cars gleefully violates all the ingrained rules which governed Hollywood’s treatment of acceptable behaviour for decades. It’s not just that crime is allowed to pay; it’s that it’s no longer even crime, but rather the essence of business. Beneath its casually entertaining surface, Used Cars celebrates the depressing essence of corporate capitalism and the immorality which now rules business and a politics whose only concern is supporting corporate interests. 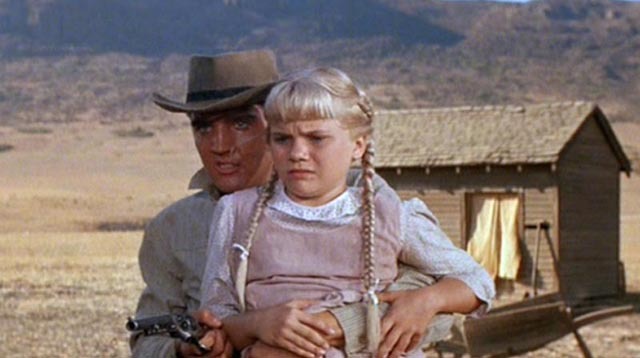 A more traditionally liberal point of view governs Don Siegel’s Flaming Star (1960), notable as one of the few genuine movies Elvis Presley made in his generally embarrassing career as a movie star (thirty-one features in sixteen years). A B-movie efficiently directed by Siegel, it was a box office failure in part because it veered away from the Presley formula (despite a couple of shoe-horned songs), giving him his most substantial role in a dark and violent story of racism. Elvis plays Pacer Burton, son of a white father (John McIntyre) and an Indian mother (Dolores del Rio). When trouble brews between the white settlers and the local Kiowa tribe which is attacking families who have settled on their lands, the Burton family, who represent the possibility for peaceful coexistence, are caught in the middle and Pacer is pushed to pick sides; all the overt and not-so-visible racism to which he’s always been subjected pushes him to reject his “white” side. The script by Nunnally Johnson and Clair Huffaker, based on Huffaker’s novel, is intelligent and nuanced and Elvis rises to the occasion by giving a solid, heartfelt performance. Within its limitations, it treats the consequences of American expansion in the 19th Century more directly than many more prestigious westerns. Rather than celebrating Manifest Destiny, it takes a clear-eyed look at the human costs of the violence at its centre. The Flaming Star Blu-ray has Twilight Time’s usual isolated score track, plus an informative commentary by Nick Redman with Lem Dobbs. Used Cars has two isolated score tracks, one being unused music, a gag reel and outtakes, some promo material, and a raucous commentary by Zemeckis, Gale and Russell, which at times becomes just three buddies enjoying each others’ company without concern for anyone who might be listening … but it nonetheless still provides a lot of stories about the low-budget production. In some things, our tastes and preferences are fixed quite early. I was drawn to fantasy at a very young age – one of the first books I ever read was H.G. Wells’ War of the Worlds (I think I was about eight). I read a lot of fantasy and science fiction up through my teens, but eventually my interest faded except for occasional things like a couple of Clive Barker’s fantasy epics (Weaveworld and Imajica), which I read in my thirties. After a certain point, I preferred horror, particularly stories rooted in the “real world” into which nasty things impinged – some of H.P. Lovecraft, most of Stephen King until his work became tedious and bloated (though in the past few years, he seems to have recovered fully and is now writing some of his best books). But that’s reading. When it comes to movies, I still like fantasy and science fiction as well as horror. And I still have a great deal of affection for movies I first saw as a child. Twilight Time recently released a brand new restored edition of Henry Levin’s Journey to the Center of the Earth (1959) as well as a Blu-ray of the Nathan Juran/Ray Harryhausen adaptation of H.G. Wells’ First Men in the Moon (1964). I saw both of these in a theatre five decades ago before my family emigrated from England to Canada, and back then they seemed like perfect adventures. Of course, in many respects, to an audience today they probably appear rather creaky and corny. Both are “family films” – that is, aimed at a broad audience with things thrown in for the kids as well as something to keep their parents from getting bored. Both have fine casts and literate scripts (the first by Walter Reisch and Charles Brackett, the second by Nigel Kneale and Jan Read); both temper danger-filled adventure with comedy (some of it a bit too broad for my now “mature” taste, but delightful to the boy I was). And both have dark threads running through them, from murder in Journey to inter-species genocide in Moon. Journey is the bigger, more lavish production, shot in richly saturated colour and CinemaScope. James Mason makes a superb Professor Lindenbrook; Thayer David is deliciously sinister as the evil Count Saknussemm; Arlene Dahl is an excellent foil for Lindenbrook’s 19th Century male arrogance; and even Pat Boone does a passable job as the romantic lead (although the object of his romantic intentions [Diane Baker] remains behind in Edinburgh, required only to sit prettily and fret). The set design (augmented by location work in Carlsbad Caverns) is opulent and on a scale that gives the film a satisfyingly epic feel. Yes, the dinosaurs are just lizards with fins and horns glued on them, shot in slow motion to give them scale and weight, but the movie is so engaging that by the time we get to them, we’re willing shelve our disdain and go along with the illusion. And for a kid (and even today, I admit) the fate of the duck Gertrude is quite traumatic. First Men in the Moon has the benefit of those Harryhausen stop-motion effects, which for once are supported by a decent script; the set-pieces are integrated into the story, rather than the story being a mere scaffolding to get from one effects sequence to the next, which was all-too-often the case with Harryhausen’s films. Although this represents the best work of director Juran’s undistinguished career, it still seems a pity that producer Charles Schneer wouldn’t hire a better director this time out – but then, it always seemed that Harryhausen didn’t want to have to compete with a strong creative force behind the camera; he was, after all, the main creative force in all the films he worked on. In some ways, this is a more tonally interesting movie than Journey; while much of it is played for comedic period charm – with Lionel Jeffries as the quintessential eccentric inventor Joseph Cavor, and Edward Judd’s Arnold Bedford and Martha Hyer’s Kate Callender a romantic comedy couple (he’s a bit of a scoundrel, while she’s a feisty suffragette) – the film’s subtext is about the dark side of 19th Century colonial adventurism which leads to “inadvertent” genocide. Rather darker than your average kids’ adventure movie. Both films have the usual isolated score track – Bernard Herrmann’s majestic music for Journey and Laurie Johnson’s jaunty but more formulaic background for Moon. Journey has a fine commentary in which Steven C. Smith and Nick Redman are joined by actress Diane Baker, while the Moon track has FX technician Randall William Cook joined by an elderly Harryhausen. I confess that I gave up quite quickly on this track as Cook’s awe of the master seemed to prevent him asking clear questions, leaving Harryhausen to meander vaguely to no particular purpose. There are also a couple of brief extras, one a promo from the time of the film’s release, the other an introduction by Cook. Both Journey to the Center of the Earth and First Men in the Moon were popular when released, and received generally favourable reviews. Which is more than you can say for John Boorman’s Zardoz (1974). This (along with Point Blank) has always been my favourite Boorman movie and I saw it several times during its brief theatrical run before it vanished under the weight of critical scorn and audience indifference. It’s always been a puzzle to me how certain movies can be a success while others are held in contempt (I have no idea why so many people hated Andrew Stanton’s terrific rendering of Edgar Rice Burroughs’ John Carter). All movies require that we as viewers give ourselves over to their created worlds, but sometimes people just aren’t willing. Zardoz is a work rich in theme and remains even now a masterpiece of visual imagination, with its sophisticated effects all rendered directly in camera (no CGI back then). While in broad outline Boorman’s script (which he got financed on the strength of the success of Deliverance) is akin to H.G. Wells’ The Time Machine with its parable of class conflict, its narrative is intricately constructed and requires attention from the viewer to follow. In a distant future, an elite society of immortals have sealed themselves away from a world which has been devastated by some unnamed catastrophe. Outside live the Brutals, an excess population viewed as little more than vermin. These Brutals are now controlled by a vicious warrior class, the Exterminators who serve the god Zardoz, a giant flying stone head which gives them orders and supplies them with weapons. As the film starts, one of the Exterminators hides himself aboard the head and penetrates the Immortals’ haven, known as the Vortex, where his presence begins to expose the considerable cracks in their society. Boorman explores the ramifications of immortality and a society whose members are intimately connected to one another telepathically. It’s a nightmare of boredom and rigid regulation. Some rebel, the punishment for which is enforced ageing and ultimately an endless existence of senility; others, the Apathetics, simply lose all will and are overcome by inertia. As the scientist May (Sara Kestelman) studies the intruder Zed (Sean Connery) against the wishes of Consuella (Charlotte Rampling), all the facets of this society are gradually exposed along with the story of Zed’s origins and how he managed to get inside the Vortex. The poet Arthur Frayne (Niall Buggy) had long ago been given the task of keeping the outside lands under control; he invented Zardoz and created the Exterminators through selective breeding. In time, he redirected his army from slaughtering the Brutals to enslaving them for the production of food which was needed inside the Vortex as more Immortals either rebelled or became Apathetic. Zed was the end result of his eugenics program, stronger and more intelligent than any of the Immortals and essentially programmed to enter and destroy the Vortex. Trapped in their own cocoon, the Immortals are doomed to ennui and an unbearable, unending tedium; Zed has come to release them by reintroducing death, in essence restarting a natural life cycle. Boorman in his commentary track, and Redman along with film historians Jeff Bond and Joe Fordham in theirs, all feel the need to make excuses for the film – that it’s overloaded with too many ideas which render it too difficult to follow, that despite its visual elegance (it was shot by the great Geoffrey Unsworth), there are too many risible design elements, in particular Connery’s costume and the now-dated hippie-esque community of the Immortals. Personally, I have no difficulty with any of these things; yes, Zardoz is a product of its time, but really few films are not marked by the time in which they were made. It is, however, as Boorman says, a film which requires that you be willing to go along with it, and if you can do that, it’s rich, challenging, quite beautiful in its visual and thematic poetry, and in the end moving. Redman says that it’s the kind of film that, if you see it when you’re young, you think wow, that’s profound; but years later, after you’ve become more experienced and mature, you think wow, that’s kind of crap. I guess as I’ve aged, despite intervening decades of experience, I’ve never matured. I find it just as easy to give myself to Zardoz now as I did back in 1974 and I find watching it now just as rewarding as I did then. It’s strange, idiosyncratic, crammed with ideas and rendered with an unselfconscious sense of poetry; in a word, unique – and why wouldn’t you want to surrender to something like that? Boorman’s commentary track is very engaging, marked by a modest awareness of his own achievement and its possible shortcomings. The film was obviously very personal at the time he made it, and it was shot in and around his own home in County Wicklow, Ireland. ; the second track with Redman, Bond and Fordham, despite their caveats about the film as art, provides some fascinating and detailed information about how the film was made, in particular the remarkable on-location, in-camera effects work (that giant flying head was actually out there on the mountains of Wicklow interacting with the cast). This entry was posted in Commentary, Review and tagged Action, Blu-Ray, Comedy, Directors, Fantasy, Politics, Science Fiction, Twilight Time, Western. Bookmark the permalink.